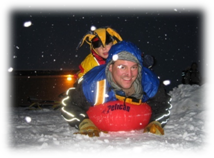 Atikokan has numerous parks and playgrounds for the children and the children at heart, to play and wear off some energy. Atikokan is home to three volunteer run outdoor skating rinks. 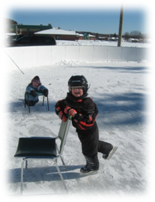 At any time day or night you can find someone our using the ice, whether your pleasure is hockey, figure skating or just out for fun, our facilities can accommodate your needs. Hemlock Sportsplex - Outdoor skating rink in the winter, asphalt surface for street hockey, basketball etc in the summer. Beach Volleyball court in the summer. Come out and enjoy our fun and exciting toboggan hill located at the entrance to Bunnell Park. The hill is illuminated so day or night you can enjoy the ride. The Sliding Hill is not supervised, children should be accompanied by and adult. The Sliding Hill also is host to the annual Lions Club Christmas Tree bonfire. Atikokan has two Baseball Diamonds, White Street Ball Diamond located on White Street and Don Park Ball Diamond located behind McRorie Avenue.